The Carolina Covenant promises, and provides, a debt-free undergraduate education to talented students from low-income families. Covenant Scholars may not want to stop once they have their bachelor’s degree in hand, but keep on striving for a master’s degree, or even a Ph.D. That’s where The Graduate School’s Royster Society of Fellows comes in. 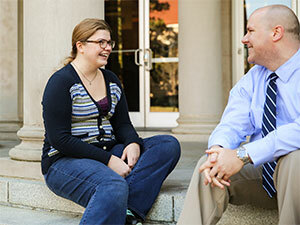 The Royster Society’s mentorship program for the Covenant Scholars got its start in 2009 when the fellows decided they’d like to provide mentoring to Covenant Scholars to help these undergraduates explore advanced study. The mentorship program pairs Royster graduate fellows and third- or fourth-year undergraduate Covenant Scholars based on shared research or study interests. Fellows meet one-on-one with their mentees at least every three or four weeks. In these conversations, the Royster fellows act as sounding boards for the undergraduate students, listening to their interests, sharing their own experiences within graduate study and offering advice on how a graduate degree might be of benefit. The fellows also provide two or three workshops on graduate education-oriented topics each semester. These workshops have included talks by graduate faculty and students, tips on how to get into graduate school, how to write an effective personal statement and graduate school application, and career exploration topics. Mike Caprino, a Royster fellow and doctoral student in education, is now leading the Royster Society mentoring program for the 2014-15 academic year, after having mentored a Covenant Scholar. Listen to Mike Caprino and Linaka Norman reflect on their experience as mentor and mentee. Learn more about what the Carolina Covenant means to students and their families, as well as what it has brought to our University community and beyond for the past decade.